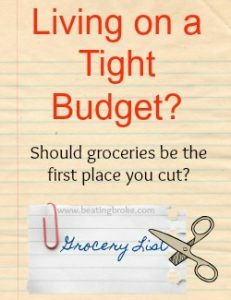 Living on a Tight Budget: Should Groceries Be the First Place You Cut? If you’re like me, the last few years, you may have felt that you’re simply treading water when it comes to income and expenses. It seems every time our income goes up, our expenses go up, and I’m not talking about lifestyle inflation but rather insurance premiums and deductibles, etc. Like many people, I try to cut corners to make our money stretch as far as I can. I’ve certainly had times a few years ago when I bought the cheapest groceries that I could find by using coupons and sales, even though the food was processed and not that good for my body. I rationalized that I was being frugal, and, I’ll admit it, I was proud of myself. Never mind that we were eating casseroles that we didn’t really like made with processed foods or that the leftovers often went to waste because we didn’t want to eat the meal again. Never mind that both my husband and I had cholesterol well over 200 even though we were in our thirties. However, over the last few years, my opinions on grocery shopping, the foods we eat, and how to save money have changed. I still like to save money (and I still need to in order to make our budget stretch), but now I do it differently, and I feed my family differently. A few years ago, I went Paleo. I dropped a lot of weight, and my cholesterol level settled around 155, even though I was a few years older. True, our grocery budget went up, but not by as much as I expected. I learned ways to buy healthy food at a reasonable price. Where Else Can You Cut Besides Groceries? Where would you cut first? Sometimes, especially when money is tight, groceries seem like an easy place to cut. Convenience foods bought with coupons can be had for a steal. Take a look around Pinterest, and you’ll find many posts of bloggers touting how little they spend for groceries. But is this a good thing? I know groceries are typically one of the largest monthly expenses for a family, but should this automatically be the place we look first to reduce our budget? After all, there is great truth in the adage, “Pay your farmer now, or pay the doctor later. In fact, “Americans spend nearly 20% of their income on healthcare costs, while on average spending 10% of their income on food. . .Considering the age-old adage, ‘an ounce of prevention is worth a pound of cure’ may be the first step to attempt to reduce healthcare spending—and the key place to start is food consumption. If you start to consider your diet a form of preventative health care, you might start rethinking your daily meals” (University of New Hampshire). Take a look at your budget. If you don’t automatically slash your grocery budget, where else can you cut expenses? If you don’t short change your body healthy foods, you’ll save thousands on health care later on. Meanwhile, why not consider dropping your smartphone and getting a “dumb” phone? (Yes, I still have a flip phone for emergencies that we bought 10 years ago.) Can you drive your current vehicle a little longer so you don’t need to have a new car loan? Can you drop cable? Do you have subscriptions you’re paying for but you don’t use? Likely, there are several lifestyle choices you can make to cut your expenses without compromising the quality of food you can buy and eat. Do you cut other expenses so you can continue to buy quality foods, or do you prefer to slash your grocery budget? 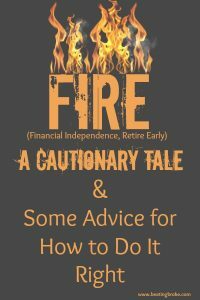 One of the biggest trends in the personal finance world in recent years has been the FIRE (Financial Independence, Retire Early) movement. At its best, it’s a passionate group of individuals seeking independence from traditional employment and a healthy work/life balance. At its worst, it’s a group of bloggers with unrealistic financial projections that are a bit too caught up with finding that perfect Instagram shot while traveling. The movement seems to be more popular in the world of bloggers compared to the offline world of coworkers and neighbors. Personal finance and FIRE bloggers often tout the income their blog is generating, and how that has led them to financial independence. Some of these folks have quit the corporate gigs and now focus fully on blogging and deriving income from their online activities. Let’s be clear: this is great! Entrepreneurial activities and finding independence outside of more traditional work arrangements can be a great thing. I’ve been in this camp for years, so I can certainly appreciate it. However, I believe there’s a bit of a leap from generating enough side income to quit a job to the idea of early retirement, and I believe the messaging around it is faulty. So, I find it important to consider alternative views of the FIRE movement. Even if you’re pursuing early retirement, hopefully you still find this discussion fruitful. We’ve had a historic bull market in stocks. It’s no surprise that the FIRE movement has taken hold in the latter stages of a historic bull market run in stocks. The decade long run in stocks has had a myriad of effects. First, people feel wealthy. The values of their assets have gone up dramatically. With a larger set of assets in the bank or a brokerage account, it’s more tempting to pull the trigger on early retirement. Second, we’ve had very low volatility. The bull market (the S&P 500) has nearly gone straight up since 2009, and naturally, this has made investors complacent. Low volatility and consistent year-after-year returns makes everyone feel like an above-average investor, and it can be tempting to think that the party will go on forever. Bull markets are great for everyone, but the prudent investor has a bit of skepticism and plans for worse days. If you’re considering early retirement, and the amount of assets you have exposed to the stock market is to be a major source of security and/or income, you should be asking yourself a number of questions such as: What if a quick, market correction of 20% or 30% occurs? How exposed am I to market fluctuations? If I had to, could I go a few years without touching the money in my stock market accounts? Earlier in her 20s, she set a goal to “retire” from full-time work at age 35, but she later decided to move that date up to 27. She wasn’t going to “retire” completely, but work flexibly after quitting her job. At that time, she planned to move to Minneapolis to be with her boyfriend. She saved more than $130,000 in a 401(k), about $25,000 in a Roth IRA and kept $20,000 in cash. She also had about $5,000 in a taxable investment account and $10,000 in a health savings account. If you withdraw money from a 401(k) account before the age of 59 ½, you are not only taxed, but you get hit with a 10% withdrawal penalty. Withdrawing money early on a 401(k) and incurring the 10% penalty is viewed by just about everyone as a really bad idea. As such, the above example becomes ridiculous quickly. The individual’s $130k in the 401(k) is now irrelevant for the early retirement scenario. Sure, that balance will grow on its own between the ages of 27 and 59 ½, but this person has 30 years until then to figure out how to get income. So, the person basically has $20k in cash, $5k in an investment account and $10k in an HSA. You can early withdraw contributions from a Roth, so to be generous, let’s just say this person has $60,000 in savings across these accounts for her FIRE scenario. A 4% withdrawal rate on $60,000 is $2,400 per year. Now, she’s living with her parents until she finds a new, full-time job, back in the IT world where she started. Since we touched on the topic of withdrawing investment or retirement money, let’s discuss withdrawal rates briefly. If you’re an investor, there are very few things you can control. They are things such as asset allocation or diversification, contribution levels and withdrawal rates. Everything else is pretty much up to Mr. Market. In very serious market corrections that occur every so often (e.g. the 2008 crash), even asset allocation or diversification doesn’t hold up very well. In 2008, essentially everything got hit (there was nowhere to hide). While asset allocation is an important consideration, it needs to be held in its proper place. As such, for a retired individual or someone considering retirement, withdrawal rate becomes the most important factor for your portfolio. Most often you’ll see the 4% number cited as the safe withdrawal rate for a portfolio. It’s reasonable, but even the 4% level can bring about risk. In a prolonged period of time, if your portfolio goes through a major correction due to a larger market event (such as 2008), the 4% withdrawal rate will severely hamper your portfolio survivability. It’s important to always recall the mathematics of loss. Bear markets hurt your portfolio more than bull markets help your portfolio. If your portfolio goes down 30%, you then need a 40%+ gain to get back to even. If you’re withdrawing 4% through a down period in your portfolio, some losses become permanent. How’s this apply to the FIRE discussion? Risk is a crucial element of any long-term financial planning, especially in a retirement scenario where regular income is either taken off the board or reduced. The amount of money you withdraw from a retirement portfolio is a major element of risk to consider. If you want to retire early, be conservative in your estimations of withdrawing money from investments and think through in advance possible scenarios where you may need to cut back on the withdrawal rate in order to maintain the long-term viability of your portfolio. It seems like much of the FIRE mentality is about escaping a mundane work environment. That might mean getting away from a 9-5 job or getting away from being an employee where you’re at the mercy of an employer. Whatever the reason behind the motivation for early retirement, a broader discussion of work seems important. Working simply for the ability to make a living and provide for yourself and your family is not only okay, it’s an admirable thing. One thing that can get lost in the pursuit of more fulfilling work is the idea that work in and of itself is still a worthwhile thing. The person who works a mundane job day in and day out while providing for his or her family is worthy of our respect just as much as a jet-setting entrepreneur managing his or her business from exotic locales. If you seek more enjoyable or fulfilling work, awesome! But realize that nothing is easy. There’s a misconception often in the FIRE community that it’s super easy to get a few passive income streams up and running, and then, you’re off! The real world doesn’t really operate this way. Other than things like simple index funds, there are very few passive income streams. For example, a friend of mine that derives his income from real estate rentals (often cited as passive income) works harder than anyone I know. You should always expect that generating income is going to require hard work. Beware the promise of online income streams. I’ve made a full-time living off of online audiences now for the last seven years, so I can say with first-hand experience that it’s not for everybody, and it’s likely much harder than you think. If online income is your goal, then go for it, but plan to work very hard for little to no money for years. Even if you get over the initial multi-year hurdle, for most people, it’ll likely never be any substantial money. Could it result in a hobby you enjoy and make a little extra cash? Yes! But for many, if they examine the hourly wage they’re earning for the time put in, they’d have been much better off working a second job elsewhere. I wish I had more patience when I was in my 20s. Since much of the FIRE conversation occurs around young people, I’d encourage anyone in their 20s (or maybe 30s) that is reading this to be patient. I was a very impatient 20-something always seeking the next thing, the next business, the next way to make a buck. While things worked out fine for me, I wish someone had sat me down and encouraged patience. You have a long career ahead of you. You will be able to do many, many awesome and fulfilling things. It’s okay to be patient, earn a paycheck and learn from your company, your co-workers, your bosses. Work your way up in your company for a few years and take on additional responsibility. The experience is extremely valuable and will aid you down the road when you want to be more independent. I’ve observed that discussions of family are often missing in the FIRE equation. “Retiring” early on a relatively small asset base gets pretty difficult when you start factoring in children. Or, what about aging parents? I can tell you from first-hand experience that kids are expensive! Even when you’re trying to “do things different” from maybe the wider culture, there are still a large number of expenses that can be difficult to avoid. While many FIRE participants maybe don’t have kids, or plan to never have kids, I’d also remind folks that things change in life! Priorities change, circumstances change, and you might find yourself with kids ten years after you assumed that you’d never have kids. Regardless of your situation, I encourage you to consider (at least to a small degree) the chance that your perspectives on family may change down the road. And if they do, having the flexibility to adjust financially will be paramount. I’ve spent roughly 1500 words poking holes in the FIRE movement. Plan to work harder than anyone else. The first tip is a basic one, but it’s often overlooked. Spend a few years working harder than anyone else setting up a business or additional income streams. Don’t quit your job, but spend your free time working. There are no guarantees, but you CAN build something valuable in your spare time without destroying your current financial picture. Don’t dismiss your experience and skills. Use them! The best way to grow additional income streams is to leverage your existing skill set and network. An easy transition from traditional employment can often be consulting in the same space. This sort of transition has the following elements working in your favor: You have skills in this space, you have a network in this space, and you have a track record you can point to which should help you land clients (often the hardest part of being on your own). Expand your skills so you can wear multiple hats. When you go out on your own, you’re going to be doing everything yourself. You’re going to selling and trying to land clients, providing the service or building the product, creating invoices, managing the books, and handling things like insurance and taxes. While you’re getting a paycheck, why not try to expand your skills so that such a transition will be smoother? Ask your employer if you can help out in other areas. This not only makes you a more valuable employee (and maybe help land a raise), but it’ll give you valuable experience in a number of areas that will help you later. Always be more conservative in your projections. Almost every entrepreneur who “takes the leap” is too optimistic with regards to projections. Initial sales and revenues are almost always lower than you think. Whatever you’re projecting to make in your first year, cut it in half and then consider how that will impact things. Additionally, make sure you have a cash cushion for personal emergencies. There’s nothing more stressful than deciding whether to pay for fixing your car or funding your business. While you’re struggling to generate revenue, life is still happening. Things break, people get sick, etc. Don’t forsake saving for “real” retirement. Probably the biggest problem with early retirement is that it means you’re no longer saving for “real” retirement. If you’re under 40, the reality is that you might have 50 years of life left to pay for. Having enough money for all circumstances that life can throw at you over such a length of time is not a simple matter. If you transition out of traditional employment to a more entrepreneurial setup, make sure you’re still socking away money for later in life. To conclude, if you’re someone drawn to the FIRE movement, congratulations! It means you want more for yourself. I encourage you to consider your future situation from a number of angles and remind yourself that what you’re doing now still has tremendous value. There’s no rush to escape it. Seek to find fulfillment in your current situation while you prudently pursue the next phase of life. Good luck. Saving and investing go together like milk and cookies, sweet and sour, and Elvis and banana peanut butter sandwiches, right? Right. Well, almost right. It’s easy for us to say that saving and investing are important parts of a personal finance plan. It’s easy for us to say that and then move on. After all, we just said they’re important, right? Not so fast. They just aren’t equally important. 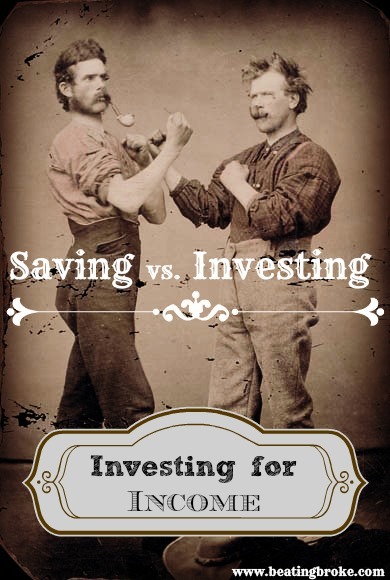 Heck, it’s another whole post, but even the different types of investing aren’t equal. Just as important as saving and investing together is the concept of when to use which, and how much. The mix of liquid savings in the form of cash accounts and CDs with the amount of your money that’s invested can be one of the most important parts of your overall personal finance plan. Traditional advice tells us that cash accounts and CDs are the super safe way to keep your money with you, and investing, in it’s varying forms is all kinds of risky. Investing in stocks? Risky. Investing in pork bellies? Risky. (unless you really like bacon. Just kidding, still risky.) But, is the amount of risk involved in investing more or less risky than leaving too much of your money in the bank to rot away at current interest rates? How about you ask the people of Cyprus if they still feel safe having their money in the bank? Few who accomplish success do so without some element of risk. In fact, the easier the path to success is perceived, the less chance there is of truly obtaining it. I don’t say that to seem philosophical. I want to make a point, however. You’ve got to have a little risk, if you want to succeed. You’ve got to have Investments if you want to succeed financially. And, I think the ratio of investments to savings should probably be much higher than most would suggest. One of the key tenets in a financial independence plan is that you need to replace your income in order to free yourself up to be independent of a job. Not independent of work, but of a job. There are, obviously, many ways that you can go about replacing that income. Decreasing your expenses is usually a part of most plans. But, most people’s expenses will only decrease so far. Sure, you can go extreme, and get them lower, but for many that isn’t what financial independence is about. Even with your expenses decreased as low as you’re willing to take them, you’ve still got to replace the income to pay those expenses. Investing can be a very good way to get started towards replacing your income. In order to replace income with investing, you’ve got to invest for income. You probably try and do that by becoming a super successful day trader and making up the income in profits from all the great deals you made. First, find yourself a few super successful day traders who have done that. Come back when you’ve given up. If you’re going to invest for income, it’s got to be reliable. It can’t rely on your ability to find a good bargain and then sell it at a massive profit a few days later. There are traders who are still waiting on Facebook to make a comeback so they can even get their money back. Reliable income is the key. For this, we need investments that are steady, don’t require the continued increase in value of the stock, and also don’t require us to sell like a fiend in order to create the income. What are these mysterious investments, you ask? Dividend stocks. Dividend stocks are stocks that pay a dividend on each share of the stock that is held. The amount of the dividend can vary, but there are many that you will find that pay dividends in the range of 2-4%. Depending on the policy of the company, they usually pay quarterly, but there are some that pay monthly and yearly. Dividend stocks aren’t the only way to invest for income, however. Investing in peer-to-peer lending in a program like Lending Club is one. Rental real estate is another. A business can even be a way to invest for income. Each has varying levels of passivity, or the amount of direct interaction on your part to earn the income. A business that you run can mean well over 40 hours a week of direct interaction to create the income. Something like Lending Club or rental real estate can be brought down to a level that borders on passive income entirely. With any investing tool, whether it be dividend stocks, lending, real estate, or some other instrument, there will be risk. With risk usually comes reward. I’ve been earning over 8% return on my Lending Club portfolio. Dividend stocks can lose value, or even stop paying dividends. The real estate market can dry up, and you can have problems finding renters. Risk is inherent. Unless you want to directly trade your time for money (call it a job), you’ve got to take on a little risk and begin setting yourself free. Savings shouldn’t be shunned completely. I still believe that an emergency fund is an important tool. I still covet a debt free lifestyle. But, once my debt is paid off, and my emergency fund is full, you can bet the rest will go towards investing for income, and building my wealth towards financial independence. How about you? What is the role of savings in your personal finance journey?